I know, I know. 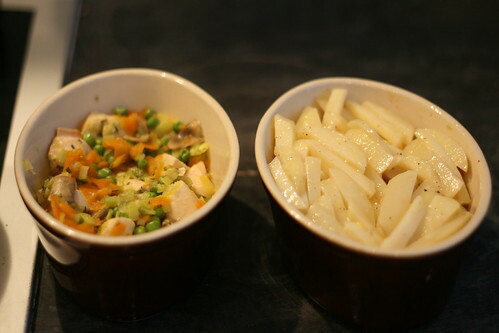 I have several versions of chicken pies, and a couple of chicken and leek pies. But this has rosti topping so it’s different, so it’s fine. Although I’m not entirely sure if it’s rosti or just potato in batons. The recipe said it was rosti. But I’m not convinced. Anyway, it was nice. Takes a bit of effort, but you get a very satisfying pie out of it. Preheat the oven to 190C and cook the chicken breasts for 15-20 minutes, or until they are cut through. 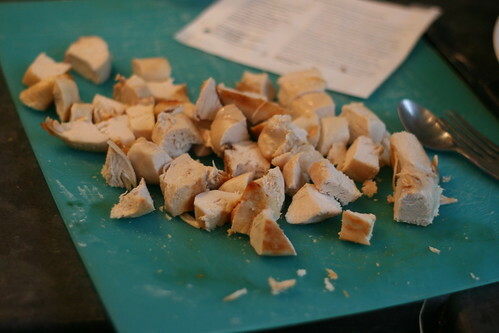 Then reduce the oven heat to 180C and cut the chicken into cubes. Whilst the chicken is cooking, peel the potatoes and cut them into batons. Then boil them for 3 minutes in a pan of water. Drain well, put in a bowl and leave to cool. When they’re cool add the two eggs, some black pepper and a pinch of salt. Mix well until the potatoes are evenly covered. Whilst the potatoes are cooking/cooling, prepare the vegetables. Trim the ends off the leeks and slice them thickly. 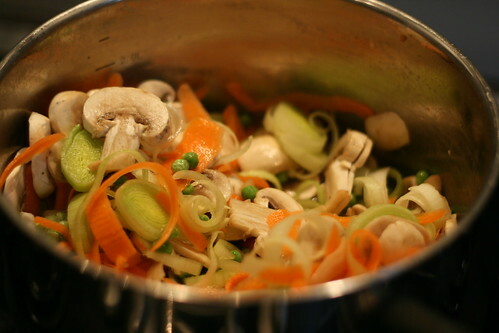 Then peel and slice the carrots (I just kept using the peeler to get long carrot ribbons) and slice the mushrooms. 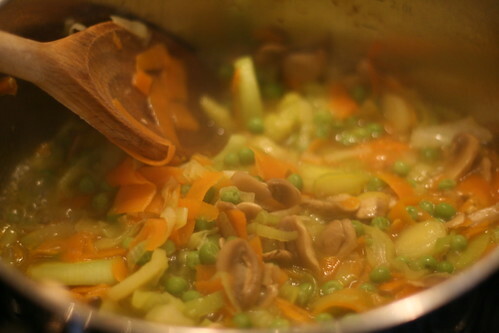 Put the stock, white wine vinegar, leeks, crushed garlic clove, carrots, peas and mushrooms in a pan before cooking over a moderate heat for 15 minutes. The leeks should be nice and soft when they’re finished. 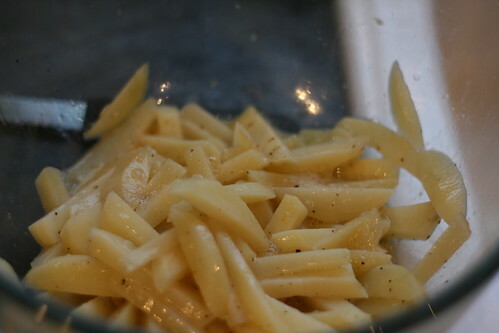 Then add the gravy granules to the pan and mix well. Add the chicken and the tarragon to the pan and cook for another 5 minutes, stirring frequently. Transfer the mixture to your pie dish. You can either make one enormous pie or use individual pie dishes. I went for the individual ones, just because I like them. Then, spread the potato mix over the top. 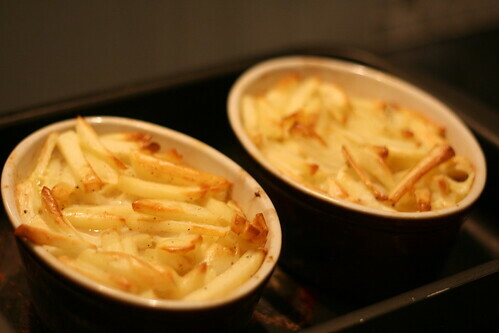 Bake in the oven for 20-25 minutes, or until the topping is golden and it smells lush. hi there. Love your website! Just wanted to check is this def the right amount of white wine vinegar? Husband thought when making it that it seemed a lot but carried on and unfortunately the pie did not come out great. Really strong vinegar taste – is that right? Hi Narelle, I’m really sorry about this! I’m not sure why it tasted so vinegary to you. Maybe I’ve just got a surprisingly strong taste for vinegar? Try adding two tablespoons of vinegar, making the rest up with chicken stock and see what you get – and again, I’m really sorry! I made this today but decided to leave out the white wine vinegar as it sounded far too much for our taste, and I couldn’t see how it would enhance the recipe. 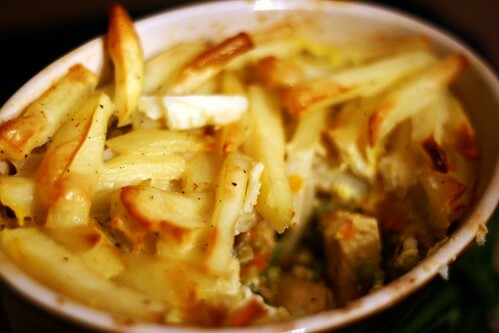 Instead of cutting the potatoes into batons I sliced them thinly and laid them on top of the chicken and vegetable mix. It got the thumbs up from the family in any case! I second the vinegar comment! Made this today without reading the comments and the veg just taste pickled. The gravy granules are completely lost. I’d definitely try the 30ml vinegar, 290ish ml stock suggestion if I made it again. Maybe I need to revisit this – it has been four years since I first made it, I’m a much better cook now! Just made this today with 300ml stock and about 40ml white wine vinegar and it worked out perfectly. So tasty and will definitely be making it again. Thanks so much for sharing this recipe. I love it!